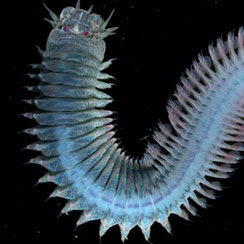 The marine worm Perinereis amblyodonta (image from here). Struck, T. H., N. Schult, T. Kusen, E. Hickman, C. Bleidorn, D. McHugh & K. M. Halanych. 2007. 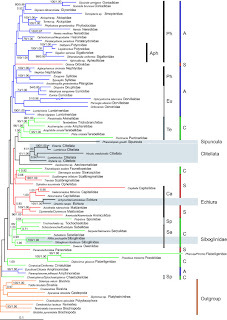 Annelid phylogeny and the status of Sipuncula and Echiura. BMC Evolutionary Biology 7: 57. This was published last year, but I only discovered it yesterday, and had a serious "Why didn't anybody tell me about this earlier?" moment. I would of liked to have known that a significant contribution had been made to one of the harder questions in animal phylogeny - the interrelationships of the annelids. Annelids have long been victim to a certain chauvinism in systematics. 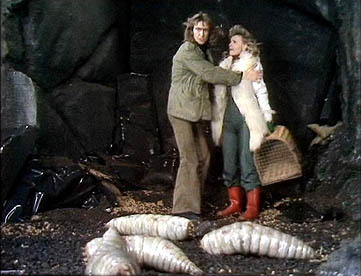 They've been treated as kind of the poor cousin to the other major animal phyla*, coupled with an idea that they were in some way "primitive". A number of other phyla, most notably the arthropods and molluscs, have at various times been explicitly or implicitly regarded as derived from annelid ancestors. It must be stressed that in very few of these cases of proposed annelid ancestry was a direct connection made to any specific annelid subgroup. 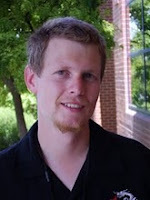 Annelid ancestry was less of a rigorous hypothesis and more of a vague assertion, in the same vein as suggestions of a "thecodont" ancestry of birds. *Though they still had the flatworms to look down on, at least. 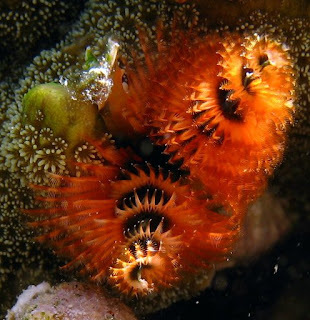 Christmas tree worm (Serpulidae - image stolen from here). Things changed somewhat with the advent of recent molecular or molecular-influenced phylogenetic studies. Three phyla in particular, the annelids, onychophorans and arthropods, had been united by their metameric segmentation, the regular repetition of separated, similar body segments (this pattern of segmentation has become obscured in many arthropods by specialisation of the separate segments, but is still recognisable in groups such as centipedes and millipedes). More recent analyses have shown the onychophorans and arthropods to have evolved their segmentation separately from annelids, forming a clade with the nematodes and other smaller phyla (the Ecdysozoa) while annelids sit in a clade called the Lophotrochozoa with such phyla as molluscs and brachiopods. Within the trochozoans, metameric segmentation might have been reborn as a defining character of annelids, but the spectre of "ancestral annelids" still didn't quite go away. For instance, while molluscs are mostly unsegmented, one supposedly basal taxon, the Neopilinida, possesses serial repetition of some organs and was suggested to demonstrate the origin of molluscs from a segmented ancestor, with the implication that "segmented" equaled "annelid" generally not too far behind. Within the annelids, things have not been much better. Traditionally, annelids have been divided into three classes, the Polychaeta (marine worms), Oligochaeta (earthworms) and Hirudinea (leeches), but it has long been recognised that this is not a satisfactory situation. It is well-established that the earthworms and leeches form a single clade, the Clitellata, but within the Clitellata the "oligochaetes" are united only by the absence of the derived features of leeches. Relationships between the Clitellata and Polychaeta have been even more contentious - authors have differed on whether the polychaetes form a monophyletic group that is sister to the Clitellata, or whether the Clitellata is nested within the polychaetes. The polychaetes in turn have been divided between about 80 families, but relationships between those families have been almost completely unresolved. 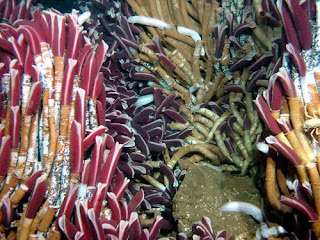 Giant tube worms (Riftia [Pogonophora] - image from here). An influential study in annelid phylogenetics was that of Rouse & Fauchauld (1997) which undertook a morphological analysis of the polychaetes. Rouse & Fauchauld found a monophyletic Polychaeta with Clitellata as sister group, and division of the polychaetes into three major clades, named Aciculata, Canalipalpata and Scolecida. They also found that the worms previously regarded as the separate phylum Pogonophora were actually highly derived annelids, as had been suggested by some authors previously. Unfortunately, support for any of the clades found was relatively low, and homoplasy was rampant. The benefits of hindsight allow us to quibble with their choice of outgroups, as well - Rouse & Fauchauld rooted their tree using the small non-segmented worm clades Sipuncula and Echiura (on which see more below) and the arthropods and onychophorans, for which many of the supposedly shared characters were probably homoplasies. A recent major molecular study (Rousset et al., 2007), despite including some 217 taxa, was unable to even demonstrate annelid monophyly, finding many of the supposed 'outgroups', including molluscs, brachiopods and nemerteans, scattered around within the annelids, and recovered almost none of the major clades of Rouse & Fauchauld (1997). However, support over the entire analysis was low, and large chunks of data were missing for many of the taxa included in the analysis. The echiuran Urechis caupo (image from here). And so we finally get to Struck et al. (2007). While Struck et al. did not cover quite as many taxa as Rousset et al. (2007), they included more genes and more complete data for the taxa included. Outgroup taxa were drawn from a number of other lophotrochozoan phyla, and the first major result of Struck et al. was the resolution of Annelida as a coherent clade, in contrast to earlier molecular studies. 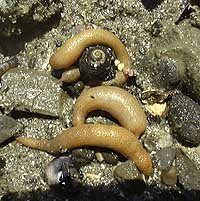 Within Annelida, polychaetes were paraphyletic with regard to Clitellata, and the closest relatives of the Clitellata were the Aeolosomatidae, previously suggested as such on morphological grounds. As for the major morphological clades of Rouse & Fauchauld, while none were strictly monophyletic, the conflict between morphological and molecular results was much reduced. Rouse & Fauchauld's Aciculata was largely monophyletic except for the inclusion of one taxon that had been included with the Scolecida, while the majority of the Scolecida formed two branches of an unresolved trichotomy with the clade including the Clitellata. (From Struck et al., 2007) ML analysis and BI of Nuc data set with 81 OTUs (-ln L = 66,627.30). 1 of 2 best trees is shown. In the other tree the trichotomy of Nephtyidae, Syllidae, and Pilargidae is resolved with Syllidae being sister of Nephtyidae. OTUs with just the genus names (e.g., Lumbricus) indicate that the sequences from different species of that genus were concatenated. Nuc consisted of 9,482 characters, from which 4,552 (28S rRNA – 2,504; 18S rRNA – 1,375; EF1α – 673) unambiguously aligned and non-saturated ones were included. BS values above 50 shown at the branches on the left; PP's on the right or alone. The branch leading to Ophryotrocha labronica is reduced by 90%. 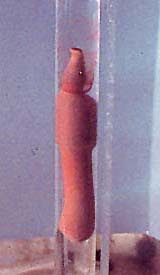 Ophryotrocha individuals have been sampled from a long time culture, which got bottlenecked several times. For 28S rRNA, Capitella forms a long branch and does not cluster with the two other Capitellidae in the analyses. ML settings: Base frequencies: A = 0.2727, C = 0.2495, G = 0.2586, T = 0.2192; Rate matrix: AC, AT, CG, GT = 1.0000, AG = 2.5097, CT = 3.7263; α = 0.4830; Proportion of invariant sites = 0.3103. Models in BI: 28S rRNA, 18S rRNA, EF1α : GTR+I+Γ. Clitellata, Echiura, Siboglinidae, Sipuncula highlighted with gray and bars indicate polychaete groups: orange = outgroup; A, blue = Aciculata; C, green = Canalipalpata; S, red = Scolecida; Ca = Capitellida; Eu = Eunicida; Ph = Phyllodocida; Sa = Sabellida; Sp = Spionida; Te = Terebelliformia; Aph = Aphroditiformia. Three small groups of worms previously classified as separate phyla were also included among the annelids. The annelid nature of the Pogonophora (corresponding to the Siboglinidae in the tree above) was confirmed, as was its position in the order Sabellida as proposed by Rouse & Fauchauld. The Echiura had also been previously suggested to be derived annelids - while the adults are non-segmented, echiurans do possess chaetae (bristles) like those of annelids and characters related to segmentation have been demonstrated in their larvae. Struck et al. found a relationship between Echiura and the polychaete family Capitellidae, as had been found in previous molecular studies. Something that is likely to cause more debate, though, is Struck et al. 's finding the Sipuncula (examples shown above in a photo from here) within the annelids. The relationships of the Sipuncula or peanut worms have long been debatable. Some authors have favoured a relationship with annelids, while others have placed them closer to molluscs. Unfortunately, Struck et al. included only one representative of the Sipuncula, and while it was nested well within the annelids its position therein was quite unstable, moving about a lot between analyses. It is worth noting here that the large-scale analysis of animal interrelationships by Dunn et al. available from yesterday as an advance online publication at Nature also positioned Sipuncula within the Annelida. Nevertheless, I can see a lot of further study being done on this result in the future. A lot remains to be done before we can fully understand the evolution of the annelids, but Struck et al. have certainly made an important contribution. Hopefully, the exorcism of the spectral "ancestral annelid" will encourage the study of annelids not as some relictual halfway-house on the way to somewhere else, but as a specialised and diverse grouping in their own right. Rouse, G. W., & K. Fauchald. 1997. Cladistics and polychaetes. Zoologica Scripta 26 (2): 139-204. Great post, those annelids are pretty remarkable animals. I'd hate to admit it, but something about that serial repetition just gives me the creeps. Having a large Nereis (as thick as my thumb) crawling on my hand was one of the most cringe-inducing experiences I've had. I can still appreciate them in picture form though. Annelids have long been victim to a certain chauvinism in systematics. They've been treated as kind of the poor cousin to the other major animal phyla*, coupled with an idea that they were in some way "primitive"
I, for one, have had utmost respect for annelids ever since I was surprisingly "bit" by a Nereis while fishing on Cape Cod as a kid.